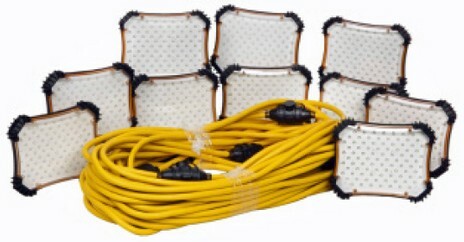 Maximize the efficiency and cost savings on your job site with Lind Equipment’s LED string lights. With all the great benefits of LED, such as low energy usage and no bulb changes, the Lind LED string lights are built to withstand the toughest environments. Each socket is equipped with a high output LED Lamp Array which provides more useable light than a traditional 100W incandescent bulb yet only consumes a fraction of the energy. Significant cost savings and reduced downtime from not having to buy and replace bulbs or lights. Extend the life of your current string lights by retrofitting them with Lind’s LED string light replacement LED lamp arrays. The replacement LED lamp array will fit in any standard (E-26) Edison socket. 6.6W High-output LED lamp array with standard Edison (E-26) base. Heavy duty ABS housing with polycarbonate lens.